The stunning footage, which was released on Friday, was captured by a flying drone, providing a bird's-eye view of the action. The video shows the Falcon 9R taking off from SpaceX's rocket-development facility in McGregor, Texas, scaring some nearby cows and then touching down as planned back at the pad about two minutes after launch. The F9R is very close in design to the Falcon 9 rocket that SpaceX already uses to launch its unmanned Dragon cargo spacecraft to the International Space Station. The Falcon 9's first stage is fueled by oxygen and kerosene and has nine Merlin rocket engines. SpaceX has been ramping up its reusable-rocket tests lately. 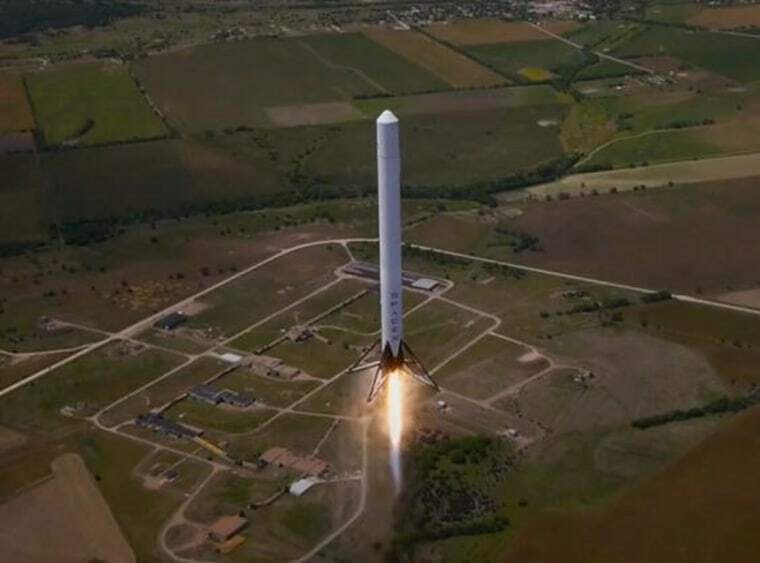 During the latest Dragon resupply launch, which took place on April 18, the company succeeded in bringing the Falcon 9's first stage back to Earth for a soft ocean splashdown, a world first. SpaceX also completed tests of its Grasshopper reusable-rocket program last year after a number of successful flights. Follow Elizabeth Howell on Twitter, or Space.com on Twitter, Facebook and Google+. Original article on Space.com.